Rara Readable Pro is an elegantly designed WordPress blog theme for distraction-free reading. Inspired by Medium.com design, the theme focuses on typeface, spacing, font size, structure and layout to give your readers the perfect reading experience. By putting an emphasis on the content, Rara Readable Pro offers your visitors high readability and easy navigation across your blog – not to mention faster loading and a pleasurable user experience. Rara Readable Pro is an elegantly designed WordPress blog theme for distraction-free reading. It’s designed in a clean and minimal way that’s easy-on-the-eye so that you can create your own journal or personal blogs! It is fully responsive and displays beautifully on all kinds of devices. 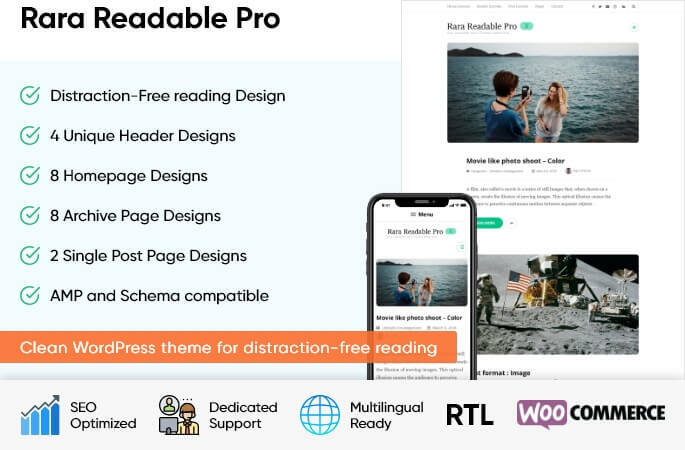 By putting an emphasis on the content, Rara Readable Pro offers your visitors high readability and easy navigation across your blog - not to mention faster loading and a pleasurable user experience. 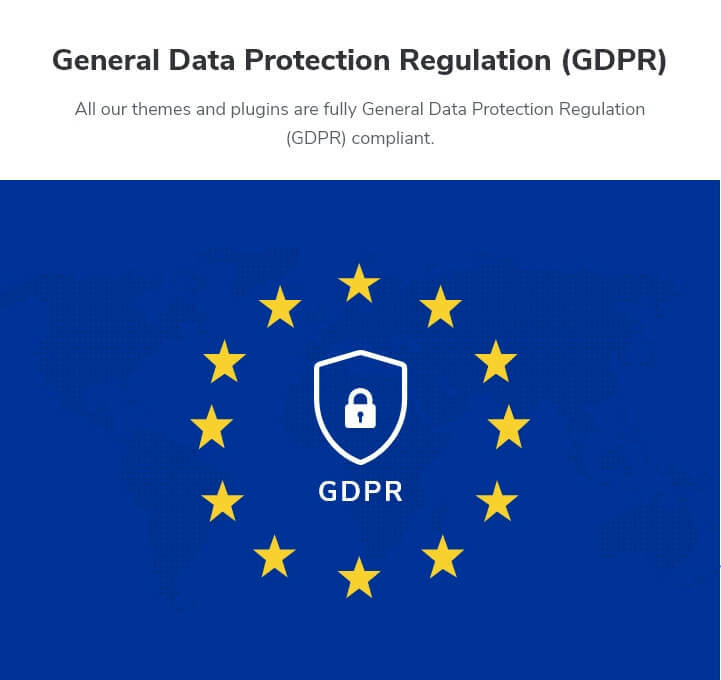 You will definitely fall in love with Rara Readable Pro’s stunning clutter-free design and its use of crisp fonts and a subtle color scheme. All in all: If you want a gorgeous and minimal theme that’s optimized for displaying beautiful and distraction-free content, this theme is for you! Get a clean, minimal and professional-looking blog without having to write codes. Change the look and feel of your blog in a few simple clicks to create your own unique brand. Ensure that your blog loads faster on all mobile devices with AMP support. Say goodbye to language barriers as the theme supports RTL and is translation-ready. It also supports WPML and Polylang, so you are all set for creating a blog in multiple languages. You want to create a clean, elegant, and fully responsive WordPress blog. You want an eye-catching blog that optimizes your content for easy reading. You want to create your own journal, personal blog, or other content-oriented blog. Rara Readable Pro adapts well and displays elegantly on devices of all screen sizes. With more than 50% of Google searches being done on mobile phones, this fully-responsive theme optimized for smart phones and passes Google mobile-friendly test. This means better rankings in search results and better user experience. Need a different look and feel? It’s as easy as clicking a button. Select from a whole range of colors and customize your blog as per your brand. Customize your blog by easily changing your font. And with over 600 Google fonts to choose from you can comfortably give your own style and personal touch to your blog. You can also change the typography of body and headings (H1, H2, H3, H4, H5, and H6). Welcome your visitors to your site in style! Set up a truly unique website and stand out from the rest of your competitors with 4 different header layouts for you to choose from. Customize your homepage as per your preference. You can go for a full-width homepage or you can also choose from the grid layout - explore and find the one that best fits your requirement! Now you have 8 different styles to choose from to set up you attractive Archive Page. You can choose your single page posts to be displayed in one of two distinct layouts. This gives you more flexibility as you can tweak things from time to time to give your readers a different experience each time they visit your page. You can select your pagination style to be either ‘Next/Previous’, ‘Numbered (1,2,3)’, ‘Load More’ button, or an ‘Auto Infinite Scroll’ for your pagination style. You can get your blog loading faster on mobile devices. Rara Readable Pro is AMP (Accelerated Mobile Pages) ready, which gives it faster load time and, therefore, more chance of having higher search page ranking. High search engine rankings? No problem. Our team of SEO experts have used their knowledge and experience to ensure the theme is SEO friendly so that search engines can easily find and rank your blog above the others. On top of it, Rara Readable Pro is also Schema-friendly, which is an important ranking factor as per Google’s recent announcement. You can add as many widgets and features to your site on the sidebar that goes on forever! There’s no limit to how many widgets you can add so customize your website as per your requirement. The theme is compatible with WooCommerce, which enables you and your visitors to enter in an ecommerce transaction with ease and comfort. You can earn good money by promoting your own product or an affiliate product. And you can sell products online through your blog. Introduce yourself with an impressive author bio. You can add your photo along with a short intro, your signature, and your social media profiles on the sidebar using Rara: Author custom widget. Always leave a beautiful impression among your visitors. Having a fallback banner image for your single post or page will automatically show in case you have not selected any image for that particular post or page. Use your social media to boost your business with easy integration supported by Rara Readable Pro. Display your social links on your blog and grow your social presence! The theme also supports Russian and Chinese social media like OK, VK, qq, Zing, and others. Show the most related posts in the same category or tag to the one that your visitor is currently reading. This increases the engagement on your page and helps you in internal link building. You can improve your on-page SEO and get better Google rankings. With Rara Readable Pro, you can make your blog header sticky. This allows your blog’s name, navigation menu, and social media buttons to always stay on top of your page. So your readers can access these buttons all the time making the blog more interactive. You can easily integrate social sharing buttons of Facebook, Twitter, Pinterest, Google Plus, LinkedIn, Email, StumbleUpon, and Reddit on the post page and archive page. That way, your readers can easily share your content. Add a button so that your readers can access the top of the page with a single click and do not have to go through the hassle of scrolling all the way up. That means - easier navigation and greater user experience! Have complete control over what shows in your Footer section. You can edit, add, or remove any section from your Footer, and enter your own copyright text. Help your visitors easily navigate across your blog and get a maximum engagement on your page with Rara Readable Pro’s breadcrumb option. The eye-catching and crisp font used by the theme is ensured to be of legible size, spaces, and contrast, so that your readers can enjoy visiting your blog and reading your content. Never worry about reaching an audience who speaks a different language. Rara Readable Pro theme supports localization as it can be easily translated in the local language. Do you follow a different script style? You can write your content the way you want! Rara Readable Pro WordPress blog theme supports right-to-left (RTL) scripts like Arabic besides the regular LTR languages. The theme supports Polylang WordPress plugin, which allows you to translate your site into various languages so that you can create a multilingual blog. Rara Readable Pro is compatible with WPML plugin. That means you can easily create a multilingual blog by Rara Readable Pro. Have your own unique identity and brand! Rara Readable Pro allows you to easily add a custom logo for your site. Modify CSS effects or change color of a section easily. With Rara Readable Pro theme, you can add CSS effects right from the customizer.